PassMaga | The Federal Government of Nigeria has launched N-Power, an initiative aimed at employing Nigerians and creating job employment opportunities too. 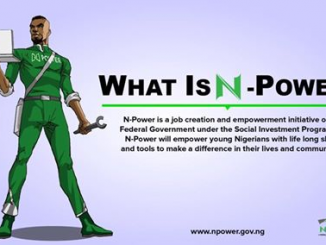 The Federal Government of Nigeria has launched N-Power, an initiative aimed at employing Nigerians and creating job employment opportunities too. The scheme is divided into three segments – the N-Power Teacher Corps, the N-Power Knowledge and N-Power Build. Under the Teachers Corps, FG said 500,000 graduates will be employed for a period of 2 years across the nation. The Teachers Corps is further divided into 4 segments.